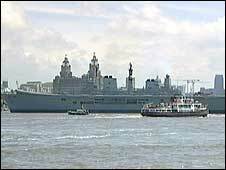 The Royal Navy's flagship HMS Ark Royal has arrived in Liverpool for the first time in her 23-year-history. The 20,000-tonne military aircraft carrier has berthed at the city's new Cruise Liner Terminal. The Ark Royal, which has a crew of more than 600, will be in the city for four days and be open to the public between 1000 and 1600 BST on Saturday. Commanding officer Captain Mike Mansergh said the crew was delighted to be spending a few days on home shores. He said: "HMS Ark Royal is ready in all respects to deploy anywhere in the world to support a wide range of missions, and we are training hard to stay at the highest levels of operational readiness. "We remain committed to maintaining an insurance policy ready to react to any problem worldwide." He added: "We are delighted to have the opportunity to pay a visit to Liverpool and Leeds, our affiliated city. "The ship's company is very excited about their visit." About half the ship's company will travel to Leeds on Sunday where they will exercise their right to march through the city centre. Ark Royal was built by Swan Hunter at Wallsend in 1978 and launched by the Queen Mother. The ship should have visited the city last year, but problems with the Cruise Liner Terminal meant the visit had to be postponed.